What happens when you’re caught between two worlds -- your homeland and your new home country? A 1.5 generation story set in Cerritos, California with Pia Ilagan Lingasin. And host/producer Paola Mardo reflects on her own 1.5 experience. Plus: Growing up in LA's Historic Filipinotown with Carlene Sobrino Bonnivier and Gregory Villanueva. Listen to this episode using the player below OR subscribe to the podcast for free using the links below or this helpful guide on how to subscribe to a podcast. Read on for show notes. Episode transcript coming soon. Marciana Sobrino Bonnivier with Gerhard Gustav Bonnivier, parents of Carlene Sobrino Bonnivier, at the Banaue Rice Terraces, near Marciana’s home in Baguio, Philippines circa 1930s. Marciana Sobrino Bonnivier, also known as Mama Chianang, at Burham Lake in Baguio, Philippines. Circa early 1930s. She is the mother of Carlene Sobrino Bonnivier. L to R: Carlene Sobrino Bonnivier takes a break from trying to pick strawberries in Salinas, California circa 1970s; Gregory Villanueva, age 8, hangs his hand-washed socks on the line in the backyard of his family’s home. His family had just moved from the Temple-Beaudry area in Historic Filipinotown to El Sereno in East Los Angeles. Gregory Villanueva (standing) talks to Carlene Sobrino Bonnivier (second from left on the panel). The two of them just met and learned they went to elementary school together in the 1940s. This was a panel for writers from LA’s Historic Filipinotown held at the old Remy's Art Gallery on West Temple Street on October 18, 2008. Gregory Villanueva and Carlene Sobrino Bonnivier at the Original Tommy’s Hamburgers in Los Angeles’ Historic Filipinotown in 2018. 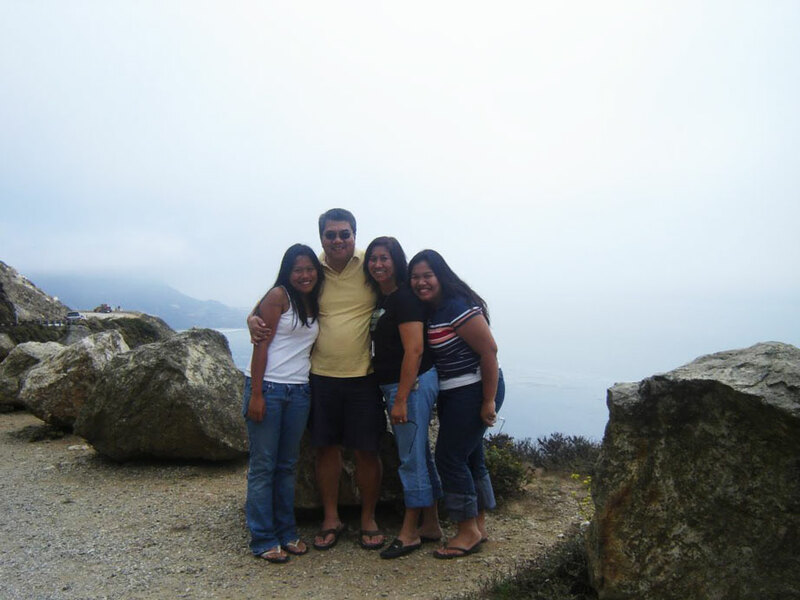 The Ilagan family in California circa 2006. From left: Abby, Wally, Ana, and Pia. The Ilagan-Lingasin family in Paris, France in 2018. From left: Ryan, Pia, Ana, Noah, Wally, and Abby. Host/producer Paola Mardo (in the black shirt) pictured with her school friends shortly before moving from Manila, Philippines to San Ramon, California in 2003. Pia Ilagan Lingasin (4th from left) moved a year later to Cerritos, California. 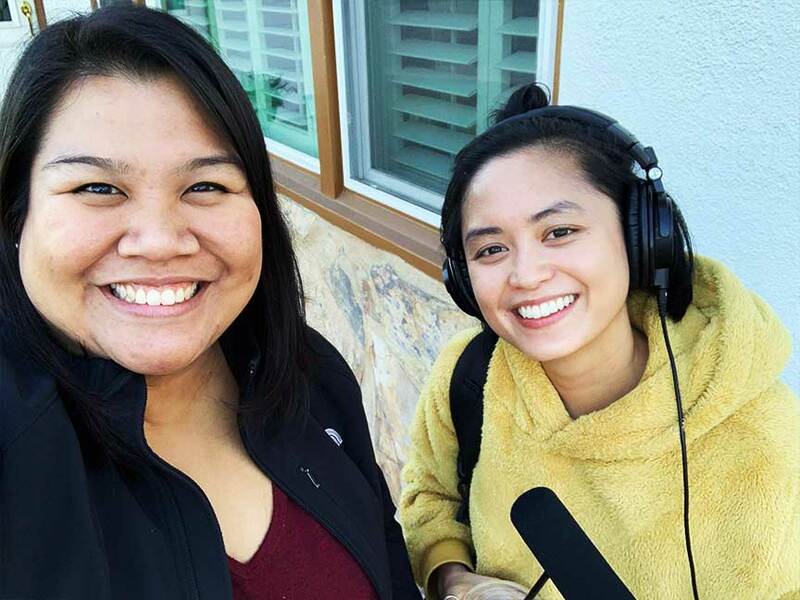 Pia Ilagan Lingasin with host/producer Paola Mardo in Cerritos, California in 2018. Research and interviews were conducted by Paola Mardo. Below is a list of some research sources. Kim, Bryan & R Brenner, Bradley & T H Liang, Christopher & A Asay, Penelope. (2003). A Qualitative Study of Adaptation Experiences of 1.5 Generation Asian Americans. Cultural diversity & ethnic minority psychology. 9. 156-70. 10.1037/1099-9809.9.2.156. Park, Kyeyoung. (1999). “I Really Do Feel I'm 1.5!”: The Construction of Self and Community by Young Korean Americans. Amerasia Journal: 1999, Vol. 25, No. 1, pp. 139-163. Rumbaut, Rubén G. (2004). Ages, Life Stages, and Generational Cohorts: Decomposing the Immigrant First and Second Generations in the United States. International Migration Review, Vol. 38, No. 3, pp. 1160-1205, Fall 2004. Long Distance is hosted and produced by Paola Mardo. Cover art is by Celina Calma. Title design by Paola Mardo. Special thanks to Katie Park, Sooh Oh, Leslie Shim, and Keith Camacho. If you dig the show and want to help, here are some ways: Subscribe to the podcast. Tell your friends. Donate. Follow the show on Instagram. Join the Long Distance Radio Club. Say hello. Watch Long Distance TV.